If you have suffered a personal injury in Aurora or elsewhere in Ontario, there is a nearby Injury Lawyers of Ontario (ILO) law affiliate that serves accident victims in your community. Our law group has personal injury law expertise as well as vast experience in successfully obtaining compensation for injured individuals. 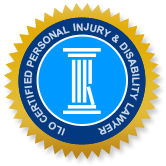 Personal injury can include (but is not limited to) injuries sustained from slip, trip and falls, dog bites, motor vehicle accidents, snowmobile accidents, brain trauma and product failures. The most important step after being hurt in an accident, is to immediately seek medical attention to determine the extent of your injuries, which may be more severe than you realize. If your injuries resulted from the negligence of another party then legal representation from an experienced attorney who understands personal injury tort law is highly recommended to achieve full compensation for injuries. Personal injury attorneys also offer help accident victims get the insurance disability benefits to which they are entitled. A demolition company in Aurora was recently fined $65,000 in addition to victim fines, for the negligent disbursement of chlorine gas which had been unreported to the Ministry of the Environment. The harm done to residents, some of whom were feeling ill effects from exposure, could have gone unchecked and unchallenged if residents had not reported this event. The same company, Priestly Demolition Inc., was fined $178,000 as a penalty for demolition violations that caused a roof collapse in 2006. The demolition of a theatre caused the roof collapse of an adjacent private school as well as a nearby bank, resulting in the death of one student and injuries to 17 people in total. The catastrophic impact on the victims and their families, particularly the wrongful death of the student, clearly extend well beyond this event. Just last year a twenty-one year old man was shot twice in the chest by police officers in Aurora. He was mistaken for another man who had allegedly shot a few other people and was on the run. This tragedy is under investigation and the loss suffered by the family of the victim is incalculable. Nothing can replace the loss of a loved one to a family; however, by seeking legal and civil action a perpetrator can at least be held responsible for the wrongful death. Motor vehicle accidents are a common and leading cause of injury in Ontario, and the Aurora area is no exception. Numerous studies have determined that most accidents are avoidable when the appropriate precautions are taken. Given that distracted driving, speeding, driving under the influence of alcohol and inadequate sleep are the most common factors in collisions, careless behaviour is responsible for many accidents and resultant injuries on Ontario roads. Personal injury, whether seen or unforeseen is an issue that causes significant harm to not just a victim of personal injury but their families as well. Most people don't have the legal skills to ascertain whether the injuries they have suffered warrant filing a personal injury claim. Accident victims are best served when they allow a personal injury attorney to assess their case and determine the best legal course of action for them. An experienced attorney is more likely to obtain maximum compensation for your damages. Do not fight the battle against insurance companies on your own. The burden of proof in a personal injury case can weigh heavily on a victim's shoulders and your main priority should be on your health and getting back to some sort of normalcy and quality of life. It is important to begin your claim as soon as possible so that you meet the requirements for filing and to allow your attorney to acquire accident reports and witness documentation while they are still available. Your ILO attorney can come to your home or hospital if you are unable to visit us in our office. Call us today for a free initial consultation.